Avoid disruptions in service by making sure that your resources are scheduled optimally and efficiently. Using Scheduling in Customer Service Hub, you can plan and schedule service activities for your customers by bringing together all your resources. Scheduling, now built atop Universal Resource Scheduling (URS), provides an efficient way to schedule resources for service activity. It considers the availability of employees, facilities, and equipment to plan schedules accordingly. It also helps customer service organizations with improved service quality by preventing over-scheduling. With the Customer Engagement apps version 9.1 release, the new scheduling experience can be enabled from the Customer Service Hub sitemap. Geographical locations where they need to offer their services. The personnel and equipment they need to perform those services. The types of bike repair services they offer. Work hours during which they perform their services. Capacity and expert level for all personnel. Contoso can benefit from the scheduling feature by quickly catering to their customers with their repair services. With the various scheduling entities, they can plan service activities for their customers by considering the availability of resources, facilities, and equipment. Organizational units are the locations where Contoso provides service to their customers. In the legacy experience the locations are referred as Sites, while in the new experience they are called Organizational units. In this example, Contoso bike repair is the site for service. Contoso lists the resources required to perform the services. Unlike in the legacy experience, you can create all resource types from the resource entity in the new experience. In this example, two resources (contacts) Bert Hair and Gilda Moss are created. Similarly, two more resources (facility/equipment) are created as Bike repair workbench - 1 and Bike repair workbench - 2, which are required to perform the service. The availability of the resources is defined in the work hours section. The resources are aligned in resource groups. 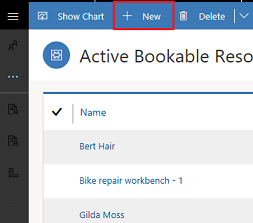 Resource Groups are referred as Resource Categories in the new experience. In the example, Bert Hair and Gilda Moss are grouped as Technicians and Bike repair workbench - 1 and Bike repair workbench - 2 are grouped as Workbenches. Contoso now collates all the above inputs to create a bike repair service record for the customer. They also specify the resources/resource groups they will need for the service. A service activity is defined to look for the next available time slot to schedule the service and align resources as per requirement. - In the new experience, select Book to access schedule board. - In the legacy experience, select Schedule to access schedule board. The schedule board displays all the service configurations at one place to quickly schedule a service. Make sure that you have the required security role or equivalent permissions. Check the Universal Resource Scheduling (URS) version. For the new scheduling experience, you should have the minimum specific version (3.2.0.405) of URS installed on your system. To check the URS version installed on your system, go to Settings and select Solutions. More information: Schedule anything with Universal Resource Scheduling (Sales, Customer Service, Field Service, Project Service Automation). Consider that importing the scheduling package will upgrade URS to the required version. If Field Service or Project Service is already installed on your org with an older version of URS, then URS will also be upgraded. The latest version of URS might not be compatible with the old versions of Field Service or Project Service. a. Access the Dynamics Insider Portal. b. Log in with your Insider credentials. c. On the Insider home page, search for Dynamics 365 for Customer Engagement Service Scheduling. d. Select the program link in the search results and select Join Now. This will add you as a participant to the program. e. On the program page, sign-up to enable Service Scheduling on URS. The link will open a simple questionnaire and one of the questions is the instance URL; provide the URL of the instance. As we receive your details, we will enable the Service Scheduling package on your Dynamics 365 for Customer Engagement instance and you will recieve a confirmation email from Microsoft. Once you receive the email, you can access your Dynamics 365 for Customer Engagement Admin portal to install Dynamics 365 for Customer Engagement Service Scheduling on the enabled instance. 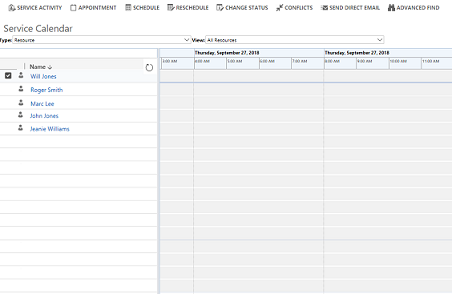 Access scheduling in the Customer Service Hub sitemap. 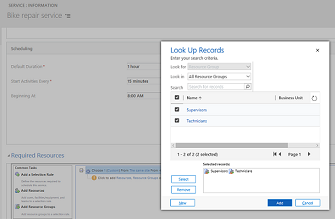 Configure all your entity records in the new experience manually from the user interface. Make sure that you have the correct security role or equivalent permissions. Know more about security roles: Manage security roles in service scheduling. The admin must follow the order as given in the Scheduling scenario while configuring entity records in the new scheduling experience. 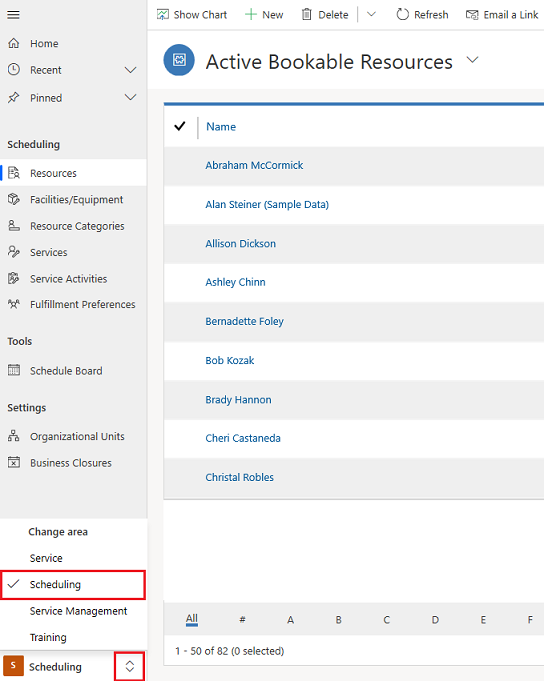 If you have been using the legacy scheduling, you would still need to configure entity records in the new experience. All entity records can be configured from the user interface except Service Activity. To know how to migrate your service activity entity records from legacy to new experience by running SDK code samples, see Migrate Service Activity entity. 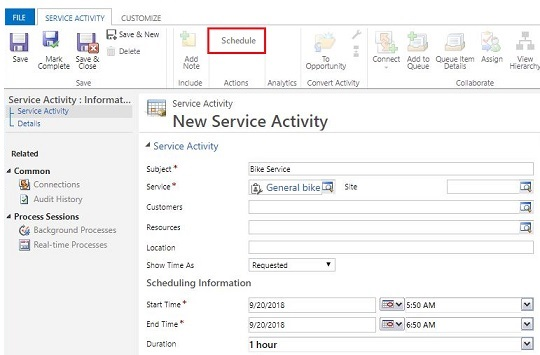 With the Customer Engagement apps version 9.1 release, Scheduling is powered by Universal Resource Scheduling (URS), and is available from the Customer Service Hub sitemap. Anything that needs to be scheduled can be termed as Resources. This can be personnel, crews, service centers, company assets (equipment), accounts, or contacts. With Resource categories, you can group your bookable resources by type. For example, you can create categories like technician, supervisor, subcontractor, vehicle, or equipment. Facilities and equipment are resources you’d use to perform services for your customers. Facilities can be physical spaces like service bays or conference rooms and equipment could be tools or other assets. To make scheduling services quick and easy, it’s helpful to predefine the specifics of the services you’d provide to customers. 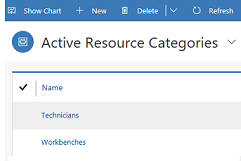 Create a service activity by finding the next time resources are available for a service. Choose and customize how to display schedule assistant results, like with neat hourly appointments or morning and afternoon time windows. 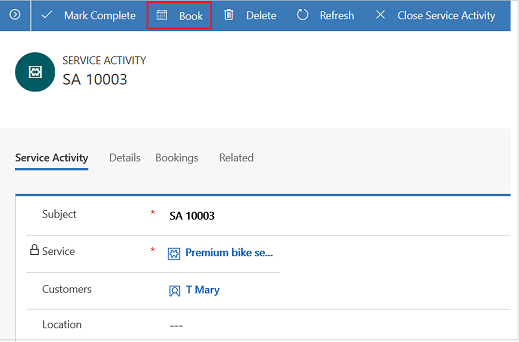 The Dynamics 365 for Customer Engagement schedule board provides an overview of resource availability and bookings you can make. Your company organizes its business by geography, function, or other areas. You can create organizational units that reflect your business. Prevent scheduling resources on holidays and other non-working days by defining business closures.